I am on a war path against added sugar… Shouldn’t we all ? Besides the obvious diabetes and obesity problems, sugar also feeds (I said feeds, not causes) cancer cells… And two of our close relatives are currently battling with the dreaded disease. Because a mother’s milk is naturally sweet , we are all basically born with a craving for sugar. Since World War II we, in the western world at least, have been consuming extraordinary amounts of it, and it is hard to stay away from it : a 2007 study involving lab rats has shown that sugar is more addictive than cocaine !!! OK, so we are not lab rats. Neither Pinky nor the Brain ^^. Even so, over the past few months I have 1) made less desserts than I used to and 2) tried to come up with new recipes that will taste sweet, without the poison. 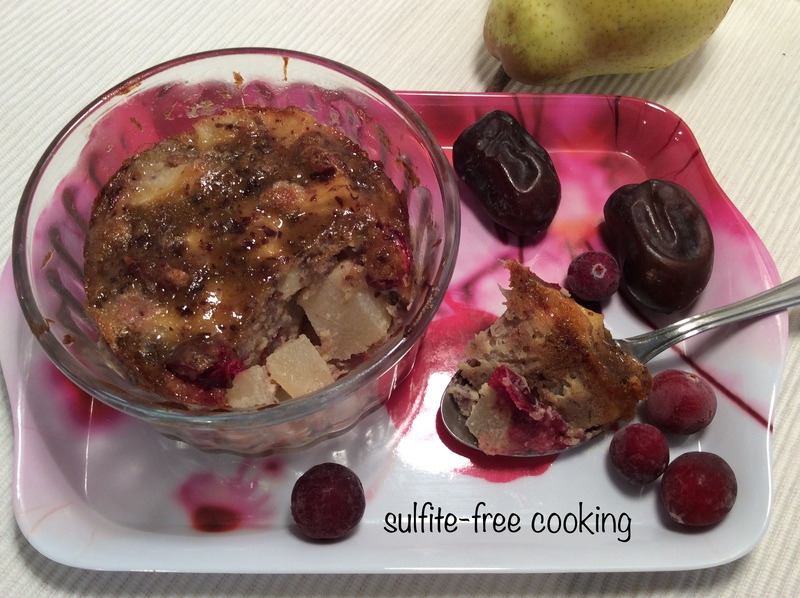 This one is basically a dairy-free « clafoutis », i.e. fruit baked in flan-like batter, where dates give the desired sweetness. Compared to many traditional desserts you may not find it very sugary ; however it will satisfy your hunger for a longer period of time thanks to the high fiber content in dates which slow down the digestive process. Let your guts take it easy ! One more thing to share : one of my tricks to control our appetite is to serve things in individual portions ; but of course you can also bake this dessert in one big dish. Just remember to increase the baking time if you do . NOTE : feel free to experiment with any fruit you like ! 1. Using an immersion blender, gradually mix the pitted dates with the beaten eggs until well blended. 2. Slightly grease 4 to 6 ramekins. Place fruit inside each dish, top with egg-date batter (I also use a fork to make sure the batter spreads evenly between the fruit pieces), and bake for 25 to 30 minutes. To be enjoyed warm or even cold !